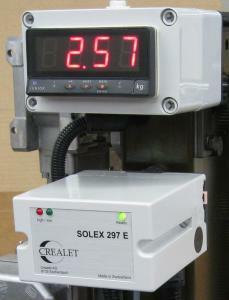 The SOLEX let-off controller optimizes the weaving procedure and simplifies operation. It also has a particular influence on the fabric quality and contributes to a regular weave structure. The controller is designed for applying warp tension control to weaving machines and comes by default without a driver. It only provides an analog-output motor speed of 0-10VDC for the external driver. There are no unnecessary functions and no keys. It is a lean-design, cost-effective solution for easy warp let-off. The SOLEX let-off controller is designed primarily for small warp beams that are used for narrow weaving machines, selvedge let-offs and for sectional warp beams for fancy fabrics or industrial technical yarns that have to be partially woven into the fabric. Depending on the application, various motor drivers and sizes are available that supply the necessary warp thread to the weaving machine and maintain the yarn tension at a constant level from full to empty beam. The warp thread tension is measured by a linear proximity sensor fitted to the back rest roller. set back, the let off stops and moves the back rest roller slowly to its reference setting and optimal starting position. In slow motion mode the let-off moves as much as the back rest roller stays in its reference setting.